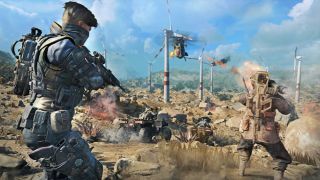 There are eight editions of Call of Duty: Black Ops 4. There's never been a better time to play games, but there's also never been a more complicated, frustrating time to buy them. For the rest of this month, however, anyone that's just interested in the Blackout battle royale mode can play for free. If you missed Blackout's free week in January, or still have a battle royale itch that needs scratching, you can shoot your way to the final spot from today until the end of the month. Later this month, you'll also get access to the new, smaller Alcatraz map, which launches today on PS4. Blops 4 hasn't been the earner that Activision's investors hoped, though it's done well enough for the publisher to bring in record revenues, while also laying off hundreds of people. The battle royale mode in particular faces steep competition from games like Fortnite and Apex Legends, both of which are free to play while Blackout normally costs £35. Blackout will be free later today. I'll update the article when it's live with instructions on how to get access.